College basketball is heading down the home stretch, college baseball has started, but let’s not forget (I know many of you aren’t) that spring practice is already getting underway across the country. We will handle spring previews for every Big 12 football team and roll them out based on when their respective spring practices begin. Next up are the Texas Longhorns who will start up spring practice on Monday March 11th. I think it is safe to say that Texas has finally found a quarterback. In fact, Ehlinger is the best quarterback in a Texas uniform since 2009 when Colt McCoy was in burnt orange. Last season, we saw Ehlinger make that leap forward, or up, depending on how you see things. After struggling a bit as a true freshman (which is expected), he was fantastic last season throwing 25 touchdowns and just five interceptions. His completion percentage also went up by nearly 10% as well as he completed 64.7% of his passes. Don’t forget about his ability to run the football as well as Ehlinger rushed for 482 yards and 16 rushing scores. All in all, Ehlinger showed that he is a good quarterback and you can certainly make a case for him being the best returning quarterback in the Big 12 this upcoming season. With Lil’Jordan Humphrey (WR) and Tre Watson (RB) gone, there will be a hole in production at both receiver and running back. What better way to fill that production than with five-star athlete Jordan Whittington. Whittington is a very strong, physical athlete who plays the game with a chip on his shoulder. By the way, he can do just more than catch the football as a receiver. He isn’t afraid to run the football in between the tackles either so he has experience not only as a wide out, but a running back as well. If you watched the Texas state title games back in December, Whittington had one of those performances that will not be soon forgotten. Everything I have heard about this guy has been positive so far and I wouldn’t be surprised to see him in the starting rotation this fall but I can’t wait to see what he can do in the spring first. 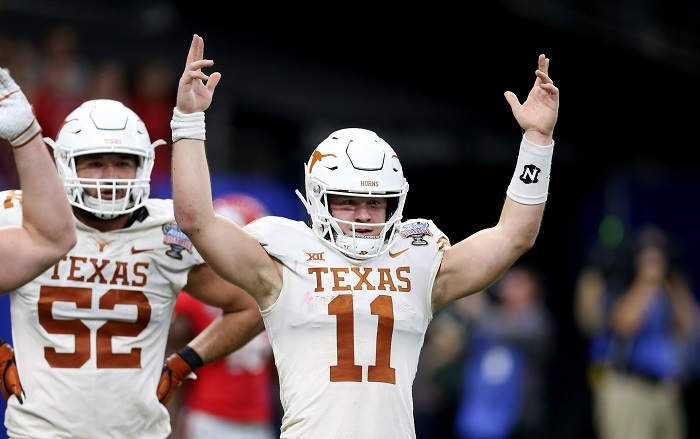 While it is nice to have a quarterback like Sam Ehlinger run the football, you never want to be too reliant on your quarterback doing a lot of the dirty work for you. Quarterbacks are hard to find and trust me, it is a lot easier to replace a running back than a quarterback. Tre Watson came in last season as a grad transfer and became the lead back for the Longhorns last season rushing for a team high 786 yards last season averaging over 6 yards per carry. Watson also caught three touchdown passes last season as well. Well, it is a new year and with Watson gone, someone must step up. Sophomore Keaontay Ingram had a solid freshman campaign rushing for 708 yards and 2 touchdowns last season and he will likely be the number one option at running back heading into the 2019 season. While that is good news, there is still a big question mark when it comes to who will be the second option to carry the rock in this backfield. Junior RB Daniel Young is more of a short yardage back while senior Kirk Johnson has had more than enough health issues during his time in Austin. This is where ATH Jordan Whittington could step in. 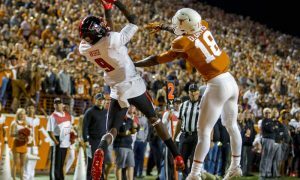 As I mentioned earlier, he is an athlete who can play at both wide receiver and running back and it appears that Texas will need to use him as a running back this spring and possibly moving forward. Out of these three guys, one of them will need to separate themselves from the other two if they want to see the field more this season. The question is, who will it be? Charles Omenihu finished out his last season in style with 9.5 sacks in 2018. Omenihu came out of nowhere and surprised plenty of people with his play, but he will now be looking to play on Sundays. With Omenihu gone, the sack numbers went with him. Now it up to some youngsters and up and comers to start making plays out there. I feel good about the defensive tackles but there are still some question marks at the end and linebacker spots. More specifically, someone who can get to the quarterback. Defensive ends, Moro Ojomo and Daniel Carson both redshirted last season and I think that Peter Mpagi will likely redshirt this season. That leaves three leading candidates left on the board (in my opinion) in Malcom Roach, Marqez Bimage and Ta’Quan Graham. Roach by far has the most experience but hasn’t played as well as I thought he would the past couple of seasons. Meanwhile, Ta’Quan Graham has flashed but hasn’t quite put it all together yet and Marquez hasn’t played much at all in his first two season on the forty acres. While I am not sure that there is a pure defensive end pass rusher ready to play right now, Texas could have some options at linebacker to help boost those sack numbers for the upcoming season. Senior Jeffrey McCulloch could be in a for a big year since Gary Johnson is gone. McCulloch has had some health issues and has gotten lost in the shuffle a bit, but he played some late last season and made a few plays particularly in the Kansas game. Now probably the biggest breakout candidate as a pass rusher is Joseph Ossai who is listed at 6’4, 245 pounds. It is very possible that Ossai might be the best pass rusher on the team right now.